TORONTO – Wilfrid Laurier University is hosting “Saturate the City: a live expression through photography and paint,” coinciding with Nuit Blanche on October 1. The exhibit, a live-painting project by Waterloo startup Jess & Mel, takes place from 7 p.m. to 2 a.m. at Laurier Toronto on the main floor of the Exchange Tower, 130 King Street West. Jess & Mel was founded and is run by artists Jessica Kalman and Melissa Falconer. Kalman is a professional photographer based in the Kitchener-Waterloo area, and Falconer is a professional self-taught visual artist specializing in portraiture and pop art. Combining the art of painting and photography, Jess & Mel create unique and contrasting mixed media pieces by painting directly onto photo canvases. Throughout the evening, Falconer will be live painting on a large photo canvas of the Toronto skyline. She will be accompanied by a video of Kalman taking and editing the photo that is being painted and discussing the process. The piece should take five to seven hours to complete. 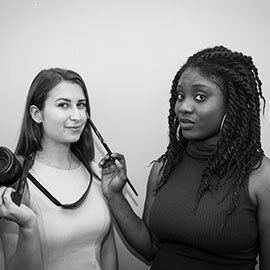 Jess & Mel is a part of Laurier’s Schlegel Centre for Entrepreneurship & Social Innovation LaunchPad program. LaunchPad is Laurier’s flagship incubator for starting and scaling new business ventures of all kinds. Serving Laurier’s students, alumni and community partners, LaunchPad is a member of Kitchener's Communitech Hub, the Waterloo Accelerator Centre, the Brantford economic development ecosystem, a vast network of alumni and investors, and most recently, part of the global Ashoka network of social entrepreneurs. The LaunchPad program provides entrepreneurs with cutting-edge, new-venture pedagogy including market validation, design thinking, prototyping, honing and testing a minimum viable product, and all the other tools and services you need to launch and sustain a venture. LaunchPad is training the next generation of new venture CEOs.